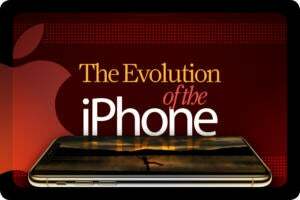 If you’re a dedicated follower of tech innovation, you no doubt recall the day in 2010 when Apple CEO Steve Jobs unveiled Apple’s new tablet computer: the iPad. Internet jokers and wacky morning DJs had a lot of fun with the name. Apple, as usual, had the last laugh. 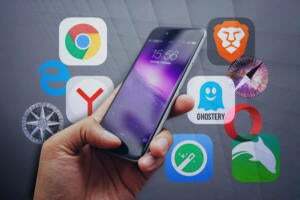 The iPad has since evolved into an unqualified success, carving out a space between laptop and smartphone, and providing a handy device for checking email, surfing the web, reading e-books, and — most importantly, perhaps — enabling the 21st-century obsession known as binge-watching. It was the device we didn’t know we needed until we had it in hand. As a bonus, we’ve included secret trivia and some cultural context — and if you’re reading this on an iPad, give yourself 100 bonus meta points. 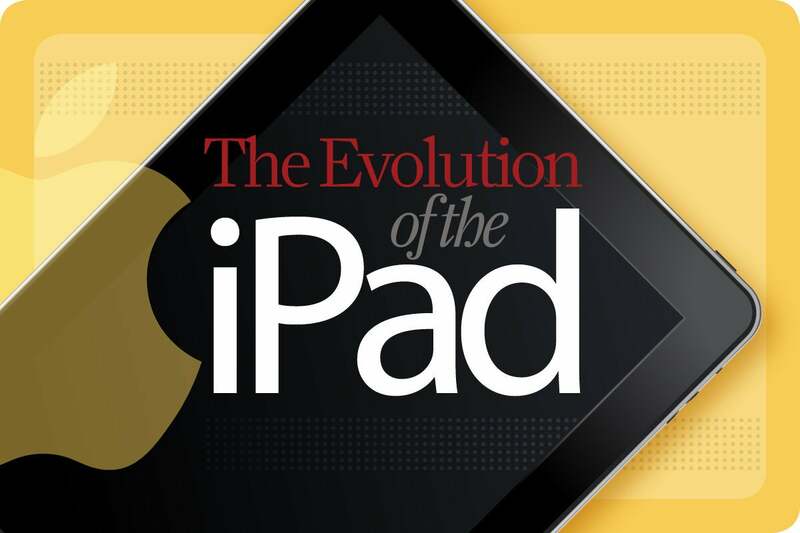 The iPad wasn’t Apple’s first foray into tablet computing. Back in 1993, the company launched the Newton MessagePad. But the iPad was another creature entirely. Reviewers hailed the device as a marvel of Information Age design, with its touchscreen interface, familiar iPhone OS, and that oddly useful three-axis accelerometer that could detect movement, tilting and flipping. Around 300,000 iPads were sold on the first day it was available. More than one million shipped in the first month. Just under 15 million were sold before the next model came out. Cultural Touchstone: The No. 1 movie at the U.S. box office on March 3, 2010 was Alice in Wonderland. Somehow, this seems relevant. Double Secret Bonus Trivia: Before the official announcement, the smart money on the rumor circuit was that the new device would be named the iTablet or the iSlate. 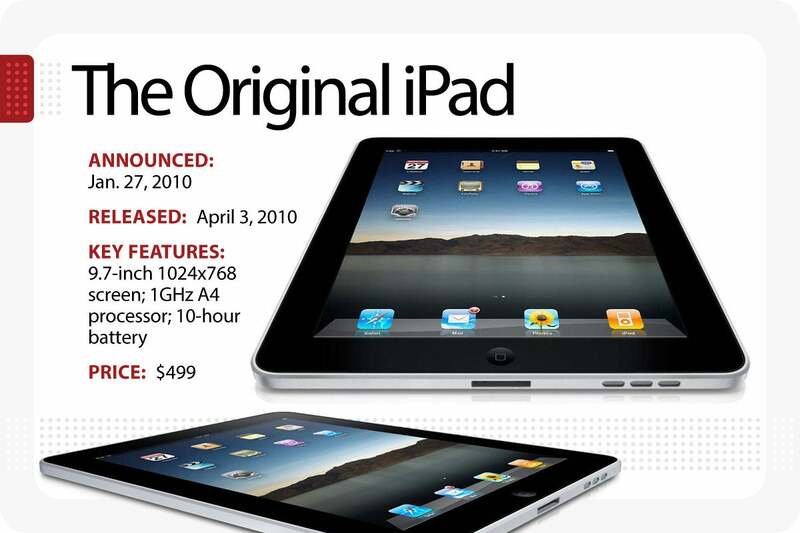 About one-third thinner and 15% lighter, the second iteration of the iPad was slimmed down and built for speed. 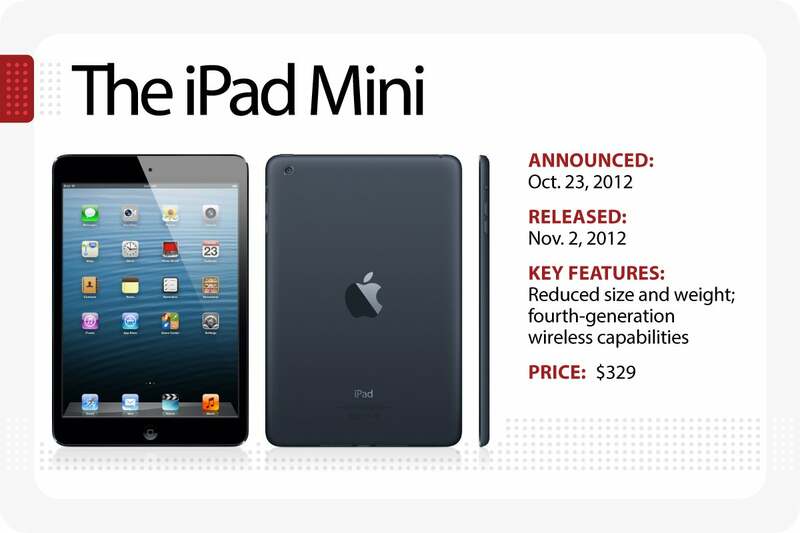 The dual-core Apple A5 processor was touted at the time as being twice as fast as the original iPad chip. 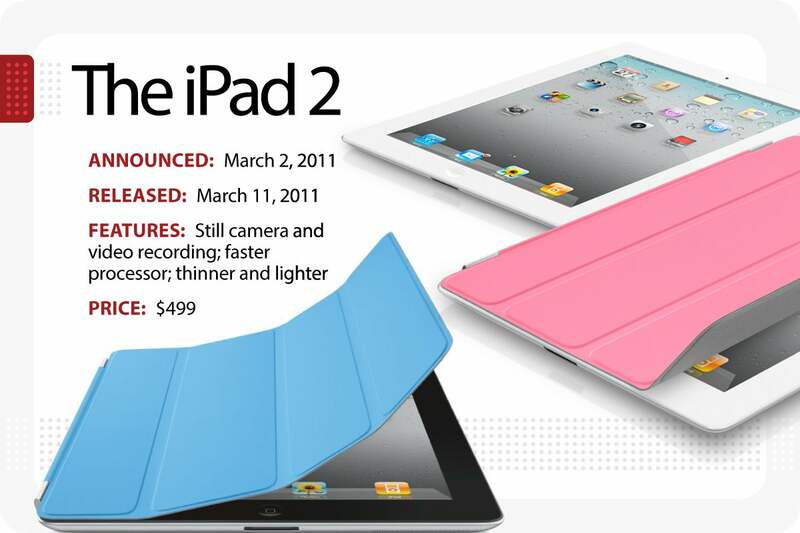 Most significantly, the iPad 2 included front and back cameras designed to support video recording and the trendy new FaceTime application. The sequel device got its own gyroscope, too, plus an ambient light monitor. Cultural Touchstone: A few months later, Amazon would release the $199 Kindle Fire tablet, running Google’s Android operating system. Double Secret Bonus Trivia: The iPad 2 came with an optional Smart Cover that protects the screen and flips, origami-style, into a display stand. Due to the unknowable mysteries of marketing, Apple dropped the numbering convention in the 2012 version of its tablet, officially calling it “The New iPad.” In any case, the big addition this time was the heralded high-def Retina display, with a resolution of 2048 x 1536 pixels, or 264 pixels per inch. Crunch the numbers, and you’ll find that’s a total of four times the pixels, in the same space, as previous models. The general consensus was that, for binge-watching purposes, the new iPad looked better than most HDTVs on the market at the time. The five-megapixel camera was a significant upgrade, as well. Cultural Touchstone: As you may recall, the world was supposed to end in December of 2012, calculated to be the end-date of a 5,126-year-long cycle in the Mesoamerican Long Count calendar. Instead, we got a new iPad. 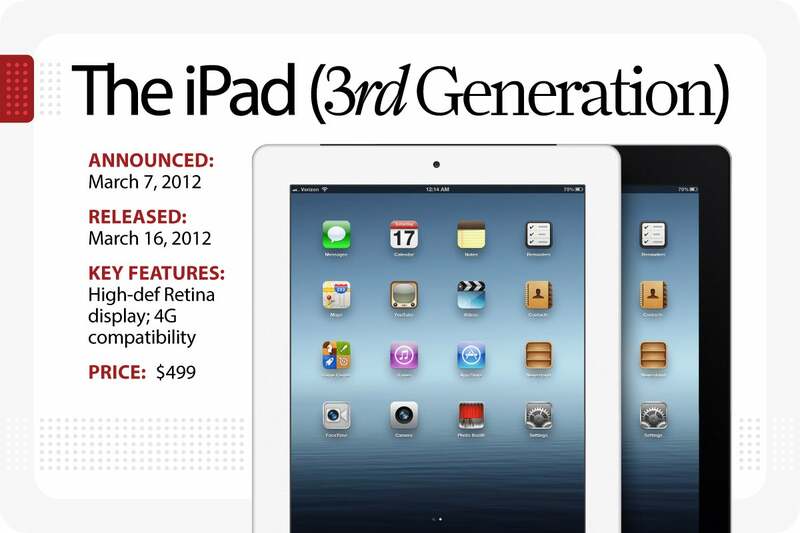 Double Secret Bonus Trivia: The third-generation iPad is slightly thicker and heavier than the iPad 2. Cultural Touchstone: 2012 also saw the release of hybrid devices and “phablets” like Google’s Nexus 7, Samsung’s Galaxy Note 10.1, and the Microsoft Surface. Double Secret Bonus Trivia: The first iPad Minis were offered in black or white, with an optional but proportionate Mini Smart Cover. Technically the fifth-generation iteration of the device, the iPad Air was designed to pack even more power into a smaller and lighter package. The 64-bit processor opened new options for high-octane productivity apps. Indeed, the Air clocked speeds nearly twice as fast as the previous model, according to independent testing. Potential buyers had plenty of options with the Air. 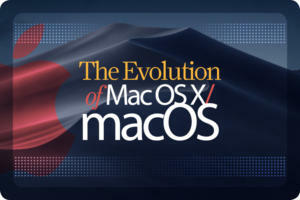 Considering all color, storage, and networking features, Apple offered 16 different versions upon initial release. Cultural Touchstone: In 2013, Disney’s smash hit animated movie Frozen inflicted the highly contagious song “Let It Go” onto the global population. Double Secret Bonus Trivia: The iPad Air was the first to feature dual microphones working in conjunction to better facilitate FaceTime and video sound. Following up on the underwhelming Mini 2 (2013) and Mini 3 (2014), the Mini 4 featured a redesigned body that was slightly taller, thinner, and lighter. The mini-tablet was praised for better overall image quality, thanks in part to a laminated display with anti-reflective coating. 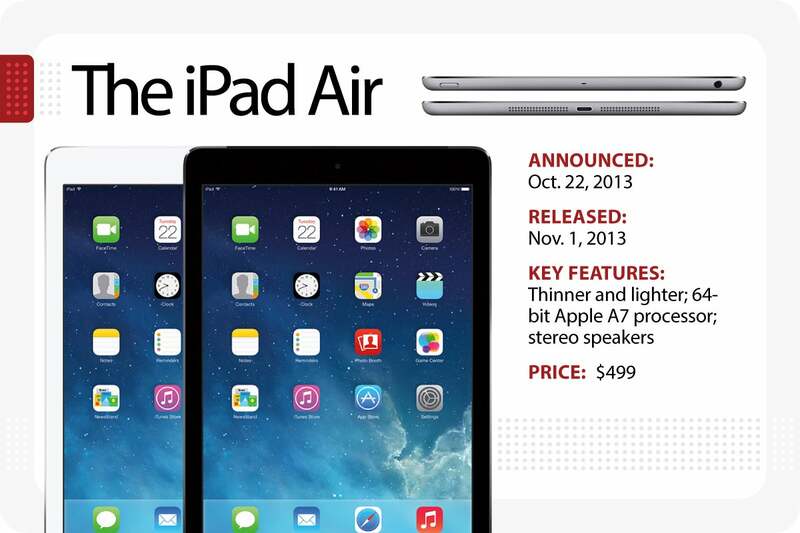 The 1.5GHz Apple A8 processor, which sped up typical tablet tasks, represented a relatively significant upgrade. 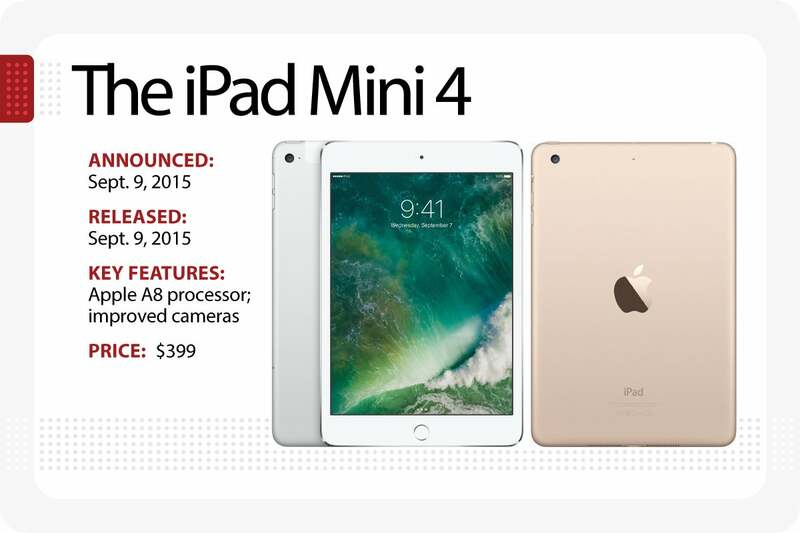 Alas, the new Mini’s debut was dramatically overshadowed by Apple’s new “Maxi” initiative – the iPad Pro (see next slide). Cultural Touchstone: The year 2015 is often marked by cultural critics as the apex of the Peak TV phenomenon as AMC’s Mad Men finally bows out. Double Secret Bonus Trivia: The improved iSight forward-facing camera added support for burst mode and slow-motion video capture. With the big and muscular iPad Pro, Apple delivered a laptop-replacement tablet system powerful enough to run most serious workplace apps. But the innovative Apple Pencil is the real star of the show. The next-generation stylus was aimed in part at those who do a lot of drawing and drafting, and more generally towards early adopters who would appreciate the technology on its own gee-whiz merits. Advanced pressure sensitivity and tilt detection complemented a bigger digital canvas, delivering a fast-forward futuristic experience, especially for graphic designers. Apple followed up with a 9.7-inch version in 2016 (at $599); then two second-generation models in 2017, with 12.9-inch and 10.5-inch displays. Cultural Touchstone: A week before the iPad Pro hit shelves, Justin Pierre James Trudeau was sworn in as the 23rd and current Prime Minister of Canada. Double Secret Bonus Trivia: The iPad Pro’s four speakers put bass on the bottom and treble at the top, no matter what orientation you’re holding the tablet. 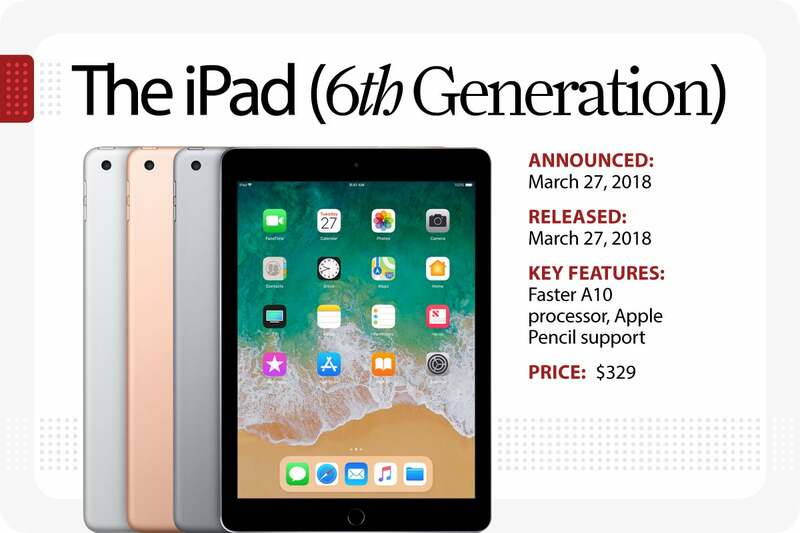 With Apple now hawking three separate lines of iPads — the Mini, the Pro, and the original — the company hit a reset button of sorts earlier this year with the sixth-generation 9.7-in. entry model known simply and once again as the iPad. 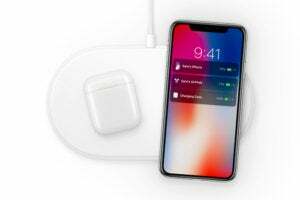 While hardware on the 2018 edition is essentially the same as the 2017 iPad, the new device adds the speedier A10 processor and supports the Apple Pencil. Bear in mind you’ll need to buy that separately, at $100, pushing the actual price for the full-featured version to $429. Cultural Touchstone: In a sign of the times, Macworld’s official testing of the new iPad included a rigorous play test of the ubiquitous Battle-Royale combat game Fortnite. Double Secret Bonus Trivia: Leveraging Pencil support, Apple is trying like crazy to get the 2018 iPad into schools as the go-to note-taking and all-around learning device for future generations. 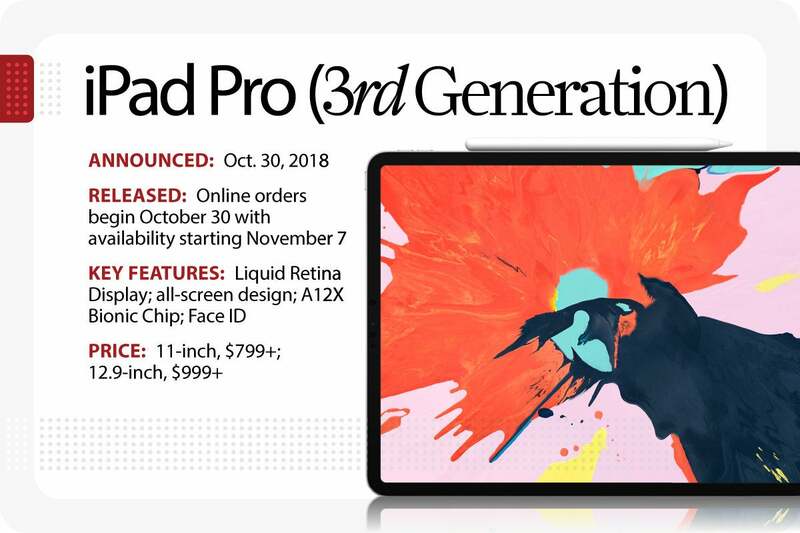 Apple's newest iPad Pro has been completely revamped, and now offers a "Liquid Retina" display like the one on the new iPhone Xr, narrower bezels and the same Face ID technology that first arrived on the iPhone X. The larger iPad Pro still has a 12.9-in. screen, while a new 11-in. version has a display that extends further to the edges. (Apple will continue selling the older 10.5-in. iPad Pro.) Both of the new models are 5.9mm thick and offer up to 1TB of storage. 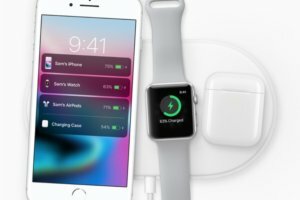 Both are powered by Apple's A12X Bionic processor and should last about 10 hours on battery while surfing, watching video or listening to music. (The Wi-Fi + cellular models are expected to last about nine hours, according to Apple.) Both have a 12MP rear-facing camera, and a 7MP TrueDepth front-facing camera. The 11-in. 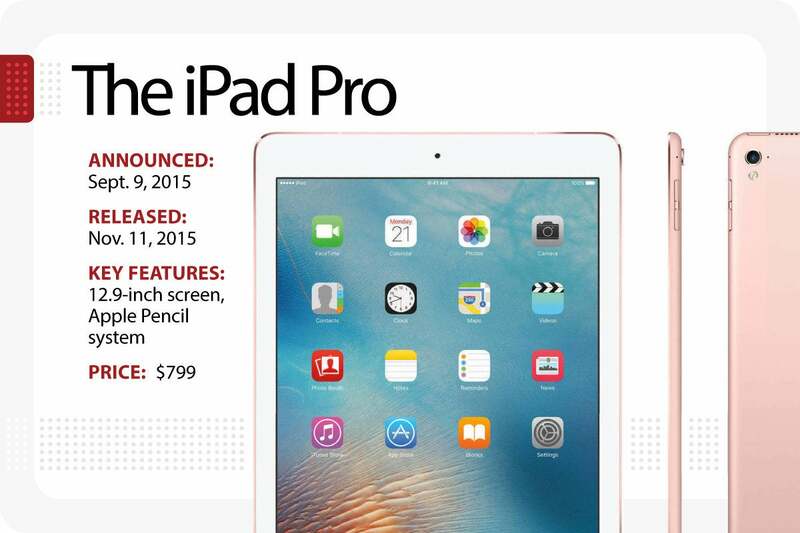 model starts at $799 (with 64GB of storage); the larger iPad Pro starts at $999. Cultural touchstone: It wouldn't be an all-new iPad Pro without an all-new Apple Pencil. And this one has a few new tricks up its sleeve. New magnets built into the tablets' edge allow the Pencil to attach to the side of the iPad Pro, where it pairs automatically and charges wirelessly. Double secret bonus trivia: For those who want their iPad Pro to be more like a laptop replacement, Apple has a new Smart Folio Keyboard. The $199 keyboard attaches magnetically and offers two different viewing angles – one for casual use (like reading in bed) and one that's more upright for desktop use.